Intel is making some modem announcements today, two future LTE generations and 5G. If you follow modems closely as SemiAccurate does, some interesting things that weren’t said emerge. First the highlights, there are four or five depending on which slide you are looking at. To save pixels for the analysis, we will just show you Intel’s version. Better yet they put out a roadmap, which again is useful for the analysis. It goes out to 2019, a pretty solid statement to appease nervous investors. 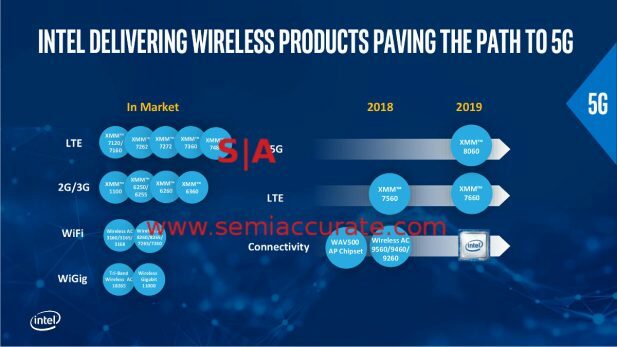 That said take a look at the future for LTE and 5G from Intel. Lets take a look at them starting with the state of the art Intel XMM7460, the modem in some of the current iPhones. We bring this up because of a claim for the next-gen XMM7560, or two claims as the case may be. 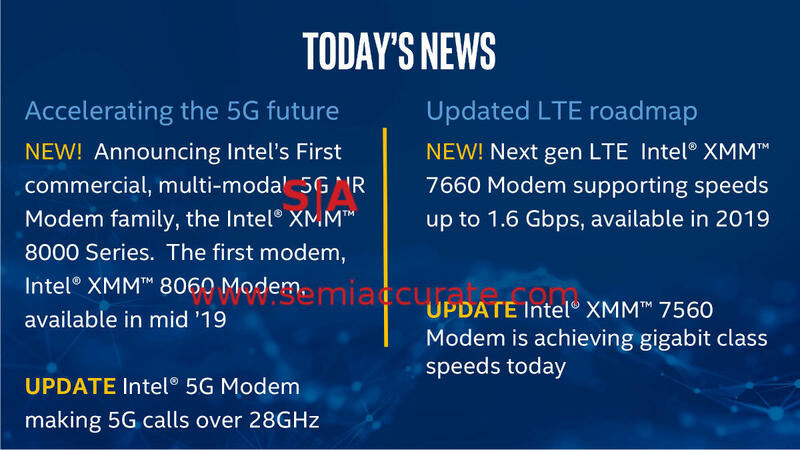 Those are, “Intel’s first global LTE modem (includes CDMA)” and, “Modem is reaching gigabit class speeds today” as the below slide shows. This is a decent feat but we take it with a huge grain of salt. Why? Once again two reasons. First is CDMA, something every Intel modem since the 71xx series has in silicon, was on the pre-release spec sheets, and for some reason devices didn’t have at release. CDMA isn’t a trick, it is old, relatively simple technology that is necessary for key markets like South Korea and the US, specifically Verizon and Sprint. 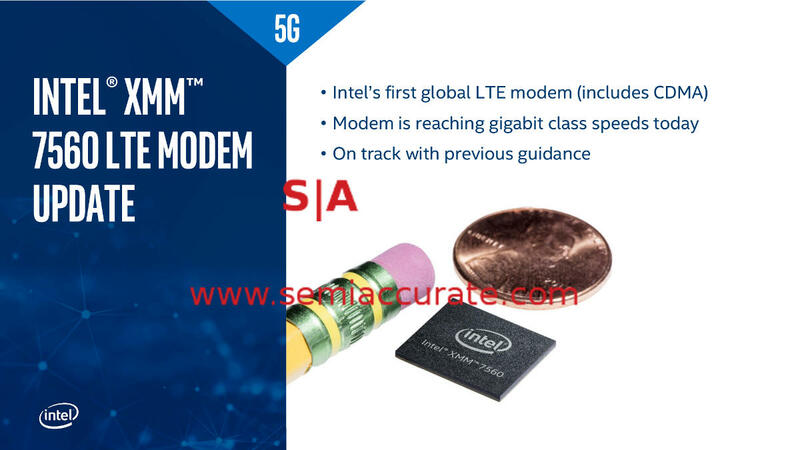 Intel listed this on every LTE modem it ever offered on pre-release spec sheets, SemiAccurate’s sources have confirmed it was in the modem silicon, and was never turned on. This cost Intel several socket wins and is the reason they are only in about half the iPhones. If you look back at the release documentation it has never been officially listed of course, something we can’t explain. *WINK* CDMA will officially be in the 7560, lets see if it still is on release. <sarcasm>Maybe it was Qualcomm’s alleged help that allowed this day to finally come</sarcasm>. The other issue is the gigabit class speeds part, again something that was promised for the 7460. You might recall that Qualcomm’s X16 modem has been available in products since January 2017 at CES, almost a full year and it supports Cat16/GbLTE. The X16 has been shown functioning in public as far back as MWC 2016 and in private long before that. There are dozens of devices on the market now with an X16 or a Qualcomm Snapdragon 835 SoC which do get gigabit speeds in the real world. You might also recall the latest iPhones also sport this pairing of Intel and Qualcomm modems, but curiously they only run at ~600Mbps. The Qualcomm iPhone variant is unquestionably capable of GbLTE speeds but for some reason is hobbled to only about 600Mbps, the same speed that the Intel XMM7460 modem is actually capable of. Not sure why this happened, the pre-release customer spec sheets for the XMM7460 said it was fully GbLTE capable, SemiAccurate is again at a loss to explain it. That said if anyone wants to forward us the email chains between Apple and Intel, we promise to giggle. So back to today’s announcements, the XMM7560 is achieving “gigabit class” speeds in the lab today. By next year, presumably at the iPhone 9 launch, Intel will be roughly analogous to the Qualcomm X20 modem which supports Cat18 downlinks and Cat13 uplinks. This makes it capable of ~1.2Gbps so gigabit class should be easy enough to nail down, why is Intel so non-specific? One might surmise that they are unsure of the final feature set, or at least the final functional feature set. SemiAccurate’s sources point to 256-QAM that is unquestionably in silicon on the Qualcomm X16 in the current iPhones but for some reason neither modem version has it on. Again we can’t explain the blurring of speeds in the XMM7560, can you help? Going out a little further in time we have the XMM7660 modem in 2019. This one is interesting not because of the Cat19 downlink good for a claimed 1.6Gbps, but because of the process tech. The XMM7560 is built in-house on Intel’s 14nm process, the XMM7660 is going to be put on Intel’s 10nm. It doesn’t work at the moment and 2019 is a close shave for getting it up according to our sources. We hope Intel sorts out their problems but if 10nm is utterly broken on consumer silicon, complex mixed-signal devices aren’t going to be easier to produce. Keep an eye on this one, it could be significant. Then we move on to 5G. 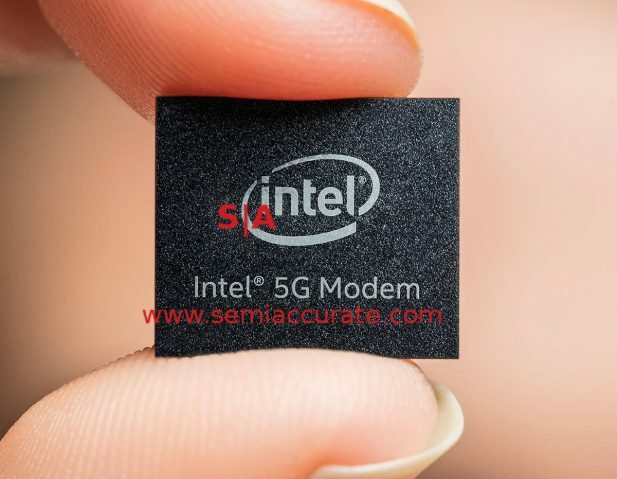 Intel announced they made their first call on 5G today, not exactly an easy thing to do. It was done on the 28Ghz mmwave band, something which catches them up to Qualcomm. For a few hours. Check SemiAccurate later today for more on this. That said it is impressive, mmwave modems are not trivial to make. More important is the announcement of the 8000-series 5G modems, specifically the 8060 modem. It is a commercial device slated for mid-2019 and it does move Intel ahead of the pack in one regard, integration. The Qualcomm X50 is a standalone 28GHz receiver that needs a compatible Qualcomm modem to operate with. Intel’s XMM8060 is an all-in-one device so it is ahead in integration. While we don’t doubt that Qualcomm has similar integrated devices, they haven’t announced one yet so score one for the blue team.